Whales, dolphins and porpoises off the west coast of Scotland are being put at risk by noise alarms used by fish farms to scare off seals, scientists are warning. Underwater acoustic deterrent devices (ADDs) deployed by over 130 fish farms can be heard at least 30 kilometres away. Lochs, bays and large areas of sea are polluted by noise that can threaten cetaceans. The marine mammals depend on sound to navigate the seas. Loud underwater noises can cause permanent hearing loss, stress and disorientation resulting in whales and dolphins beaching and dying. The number of ADDs has greatly increased in recent years as salmon farmers try to find publically acceptable ways of prevent seals from eating their fish. In the past hundreds of seals have been shot, but the US government is threatening to stop buying salmon from countries which permit seal shooting. Now new evidence presented at a scientific conference in Denmark suggests that the noise from fish farms could harm cetaceans. A study by researchers from the Scottish Association for Marine Science and the UK government’s Joint Nature Conservation Committee revealed that ADDs caused “large-scale underwater noise pollution”. 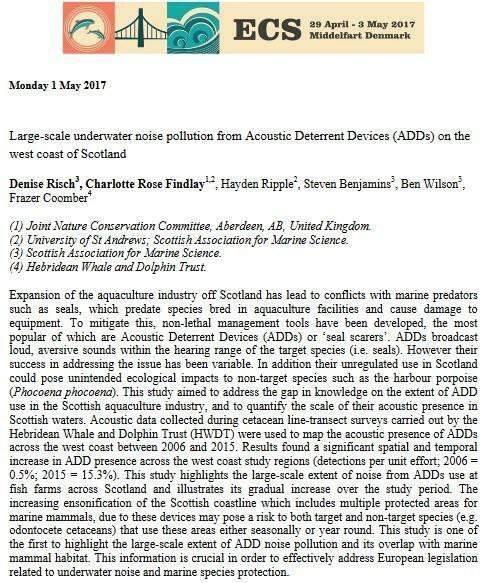 The unregulated use of the devices in Scotland “could pose unintended ecological impacts to non-target species such as the harbour porpoise”, the study concluded. Saturating the Scottish coastline with noise “may pose a risk to both target and non-target species” in areas where they were meant to be protected. According to an email released under freedom of information law by the government’s wildlife agency, Scottish Natural Heritage (SNH), the study found that the signal from ADDs “can be detected all the way across the Minch”. The noise could be detected 20 kilometres away from Portree on the Isle of Skye and 30 kilometres from Lochmaddy on North Uist. “The Sound of Mull and Loch Linnhe were completely ensonified,” said the SNH email. The revelations have prompted anti-fish-farming campaigners to file a formal complaint to the European Commission alleging failures to protect cetaceans from “deliberate and reckless disturbance”. They are demanding an immediate ban on the use of ADDs by fish farms. Sarah Dolman, policy manager for Whale and Dolphin Conservation, highlighted evidence from SNH that ADDs can be loud enough to cause hearing damage, stress and behavioural disturbance to seals and porpoises. “As protected species with important designations for their protection on the west coast this might constitute an offence,” she said. SNH pointed out that detectable noise wasn’t necessarily harmful. 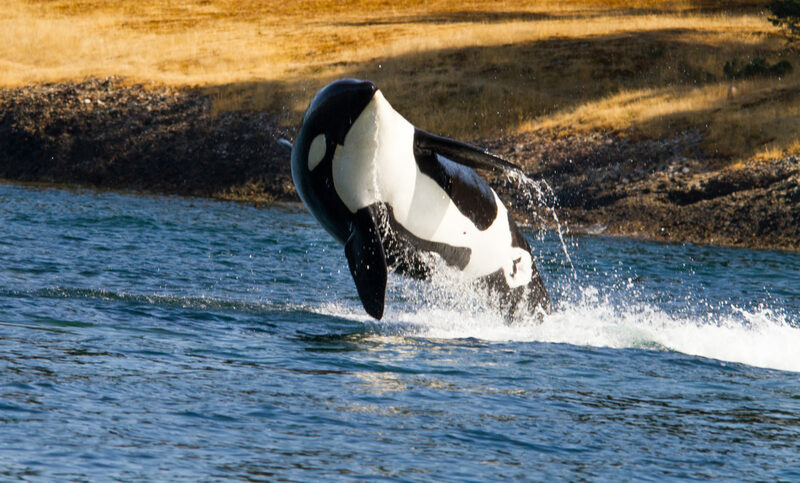 “However, available evidence shows that certain types of acoustic deterrents can disturb cetaceans and therefore we are actively working on this issue,” said SNH marine biologist, Dr Caroline Carter. Professor Ben Wilson from the Scottish Association for Marine Science in Oban stressed that more work needed to be done to establish the impact of ADDs. “We will soon begin further research to assess the potential impact of these devices on the wider underwater environment,” he said. The fish farming industry insisted that it took into account competing needs. “As farmers, we balance the need to protect seals and cetaceans with the need to protect the welfare of the fish,” said the chief executive of the Scottish Salmon Producers’ Organisation, Scott Landsburgh. Photo thanks Sean McCready via CC by 2.